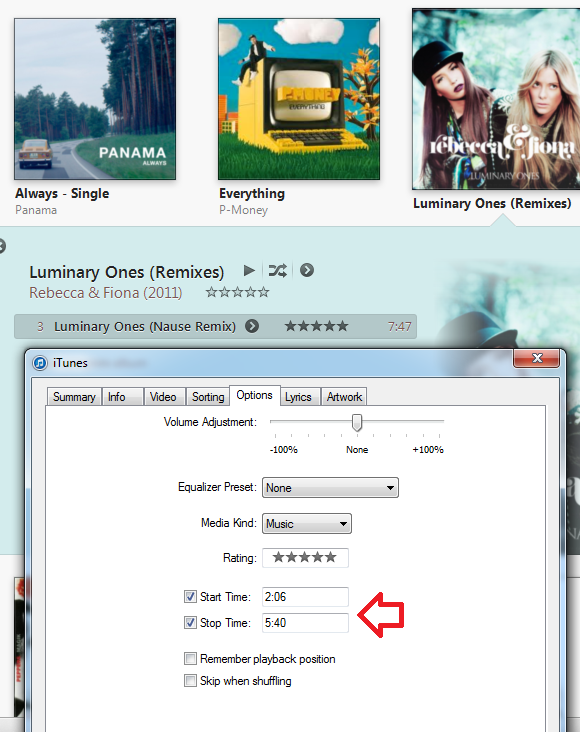 I recently purchased the Rebecca & Fiona – Luminary Ones (Nause Remix) off iTunes Store as I really like the song, and that mix in particular. The song is a 7m 47s DJ friendly mix, thus has 2 minutes of intro and 2 minutes of outro, that are honestly boring. So I have been day dreaming of making a new cut of the track with those minutes trimmed, so I jumped into iTunes to see the file type to work out what needs to be done to trim the song, and just for the laughs I look at the Options tab of the track, and low and behold, a ‘Start Time’ and ‘Stop Time’. And the settings worked on my PC, so I synced my iPhone, and they work there also. Sorted! Now I would like a fade out option, as the ending is abrupt, but there is not a nice breakdown to end on, and maybe I will trim the song externally, but 95% of my problem is solved, so most likely I won’t. Just changed the layout a touch of the web tool trying to emphasize you don’t have to pay for the patch tool. To help with this added a Big ugly link to the Help and a FAQ. So if you have Patching related questions, feel free to ask them here or on the FAQ page. If there are any web designers that want to make the patch tool less ugly, or simpler etc, I’m very open to less ugly. Also open to better work flow etc. Wow, I just read the Galaga No-Fire Cheat write-up, and that is one of the coolest things I read in ages. I love the fact it’s possible via Mame to dig though the code. I love that people care enough to do it, and I love the cracking open of an old school game cheat, to solve the how/why it occurred. hit tip to Raymond for this gem. Well it’s a new year, so hello 2014, and may it be a good one. I’ve just deleted 100+ spam comments that accumulated while I’ve been on holiday, so if you posted something brilliant and your work of art is not there, I’m sorry. Plans for the new year are more Nikon camera stuff, more Curse of the Azure bond bug fixes, and setting a new media server, as the aging SageTv server works but the problem set has evolved.